Roll the "R" when you try to pronounce the name of this nut roll that is a family favorite from my childhood and adult life, too. Our mom's Roolyet was the best. 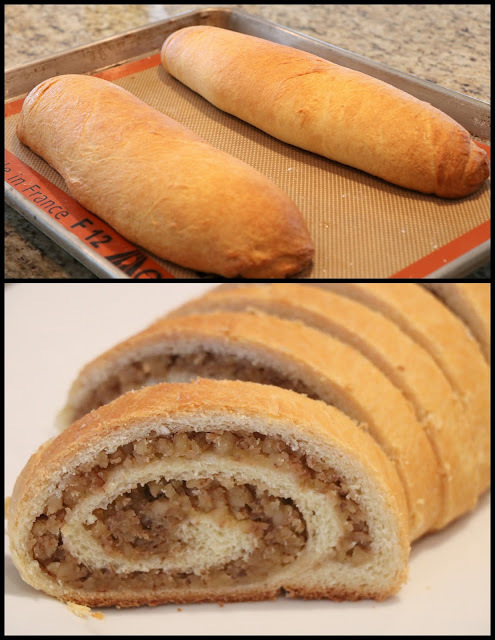 We've just managed to perfect a recipe that brings back the memory of our mom's roll. I think she would give us at least an A maybe not an A+ yet. Our pop got teary eyed when he bit into his piece because it reminded him of his beloved bride who died four years ago. In a small bowl dissolve the 2 teaspoons sugar with the scalded milk, add the yeast and mix well. In medium bowl mix the 1/2 cup milk, egg yolks, melted butter minus the tablespoon you set aside, and vanilla then add in the yeast mixture and mix well. Sift the 1 3/4 cup flour, salt, and 3 tablespoons sugar together. 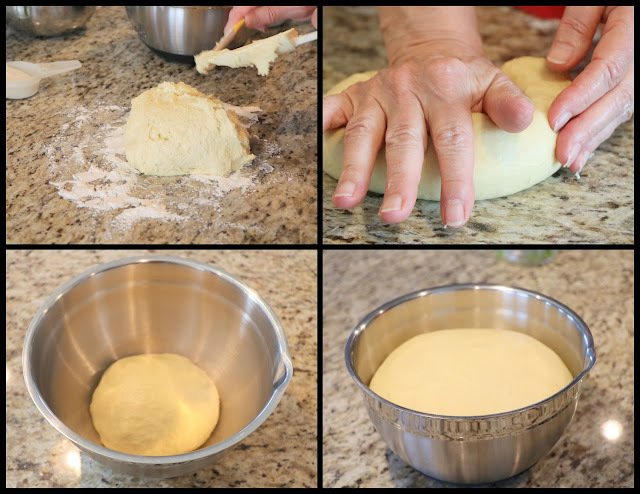 Add sifted ingredients to the wet ingredients slowly while mixing, the dough will be sticky. Prepare kneading surface with a light dusting of flour. Knead the dough adding as much of the 1/4 cup of flour needed during this process to make the dough less sticky, knead the dough for 10 minutes then form into a ball. Place the dough into a lightly greased stainless bowl that is 3 times the size of the dough and cover the bowl with a kitchen towel and place in a warm spot without drafts. Leave the dough to rise to double its size, 1-2 hours. While dough is rising prepare the filling by mixing the 2 1/2 cups ground walnuts, egg whites, 1/2 cup sugar and 1/2 teaspoon vanilla, mixing well. Divide the filling into two equal portions. Once the dough is doubled in size prepare the work surface where you will be rolling out the dough, dusting it with the powdered/icing sugar. Punch down the dough and divide it into 2 equal portions. 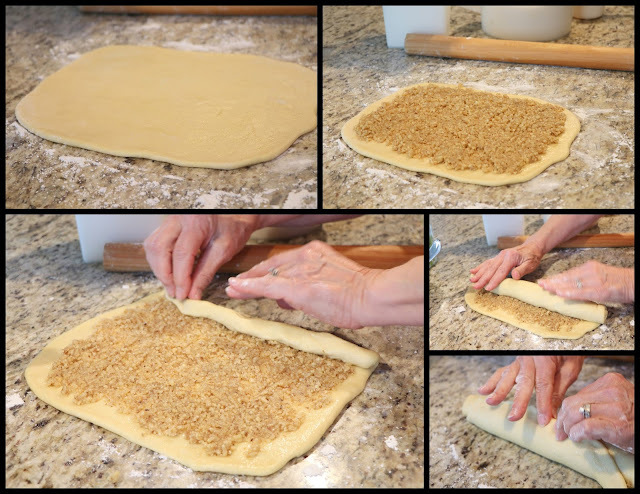 Roll each portion of the dough separately into a rectangle approximately 1/4 inch thick. Spread the filling evenly over the rectangle of dough leaving 1/2 inch free of filling along the edges. Starting at the long edge fold over the dough carefully and keep rolling into a tight roll. Pinch the seam well and pinch the ends to prevent the filling from leaking. Place the roll seam-side down on a baking sheet lined with a Silpat or parchment paper. Repeat the process for the second roll and add it to the baking sheet keeping the rolls at least 3 inches apart. Use the reserved tablespoon of melted butter to brush the tops and sides of the rolls evenly. Bake in a 350 degree oven for 25-30 minutes or until golden brown. Let cool and cut into slices to enjoy. Notes: We found that 3 cups of whole walnuts make 2-1/2 cups of ground walnuts. We used a slightly warm oven to let the dough rise in. Use a serrated/bread knife to cut the roll. This sounds terrific! Have to make!! We are having a special houseguest this weekend and I think this is a perfect thing to have on had. Have a wonderful week filled with sunshine. Amazing! What a special treat for your Pop. It sounds tricky to make but you make it look easy. This would be so lovely served for tea! My family called these loaches. But your picture and recipe are what I remember. My favorite was a poppy seed filling. Most record for kolaches are nothing that I remember. Yours had the thin pastry that was more like our poppy seed and walnut rolls. Thank you! I am so hungry. I would love this! This looks so delicious Ellen. Thank you for sharing it. Sounds delicious! I assume that you beat the egg whites and then add the sugar and nuts? My mother-in-law made a walnut filling using ground walnuts, whipping cream (not whipped) to bind the nuts, sugar and lemon juice. This filling is delicious. Anonymous, actually we did not beat the eggs whites before we added the sugar and nuts.